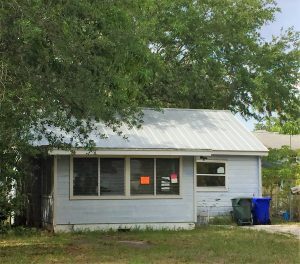 This modest one-story cottage was constructed in 1950, according to Lee County tax records. It replaced an earlier one-story home that was located on the parcel and was shown on the 1922 Sanborn Insurance Company map. On March 10, 1922, Dean Development Company conveyed this parcel to James H. Ingram for $900, subject to a restriction that any home built on this parcel cost at least $3,000. Since the 1922 Sanford Insurance Company map shows a one-story dwelling located on this lot, it can be concluded that James H. Ingram and his wife, Ruth, were the first occupants of the original house and lived there until they sold it in 1925 for $7,500. It is not known when the original house was destroyed. In 1942, after many intervening owners, the property was purchased by Elizabeth M. “Bettye” Felton, a Fort Myers real estate agent employed for many years by Douglass-Chambers Inc. She continued to make this her home until 1957. Her parents, William and Fannie Felton of Maryland, began coming to Fort Myers for the winter in the 1920’s, and her aunt and namesake, Elizabeth M. Felton, lived next door at 2647 Michigan Avenue from 1928 until 1930. Earlier address: 1025 Michigan until 1926; 122 Michigan until 1955; Dean’s Subdivision, Lot G, Lot 9.